We all want to win big. But winning big all the time just doesn’t happen. Sometimes mistakes get in the way and we barely eke out a victory. Football mistakes include a running back’s fumble in the red zone; a place kicker’s field goal attempt missing wide right; a quarterback’s poor throw leading to an interception. Missed tackles, holding penalties and blown coverage’s are also mistakes that diminish the luster of a victory and take away from the overall performance of a team. But what’s important is not the mistake, but the recovery. We all don’t play football, but we all are on the football field of life trying to score touchdowns or at least kick field goals. So, spiritually speaking, what do you do when you fumble the ball, or throw the interception, or miss the field goal? What do you do when you miss the tackle or get caught holding or miss an assignment? You get over it. You get over it, quickly, and keep playing. You are not the mistake; you may have made a mistake or two, but you are not defined by the physical limitations you may have or the foibles you may make; this is true only if you get up and try again. Winning all the time is a mindset. Winning is all about how you see yourself. Vince Lombardi said “You don’t win once in a while, you don’t do things right once in a while, you do them right all the time. Winning is habit. Unfortunately, so is losing.” In other words, you should always have the mindset of a winner; you should always believe that you are going to win, or that you should win, even if you don’t. 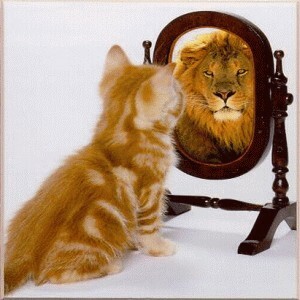 The kitten in the mirror sees himself as a Lion. Others may see him as small and puny and fragile, but that’s not how he sees himself. So the question is this: how do you see yourself? As a looser? As a failure? As a wannabe? It’s all in your head. You can be as strong and as big as you want to be. And God gives us the strength to be what we desire to be if we trust him. This is great news for all of us who aren’t 6’6”, 240 lbs, have great hands, quick feet, and a vertical leap that’s “sick.” In other words, for all of us who aren’t “freaks of nature,” we still can win and be victorious. We can win through and by our faith. We believe and are sure that God wants and wills all of his children to run through troops and leap over walls. God wants those who are feeble to be like David, and He wants those who are like David to like Him. “The weakest among them will be as mighty as King David! And the royal descendants will be like God, like the angel of the Lord who goes before them! (Zechariah 12:8-9, New Living Translation). It’s not the size of the dog in the fight, it’s the size of the fight in the dog. So remember, the next time you “just” eke out a victory, it’s still a victory. It may not be pretty, and it may not be glamorous; in fact, the win may look like 40 miles of bad road. It doesn’t matter. What matters is this; A Win, is a win, is a win. < Previous How High Will You Fly? 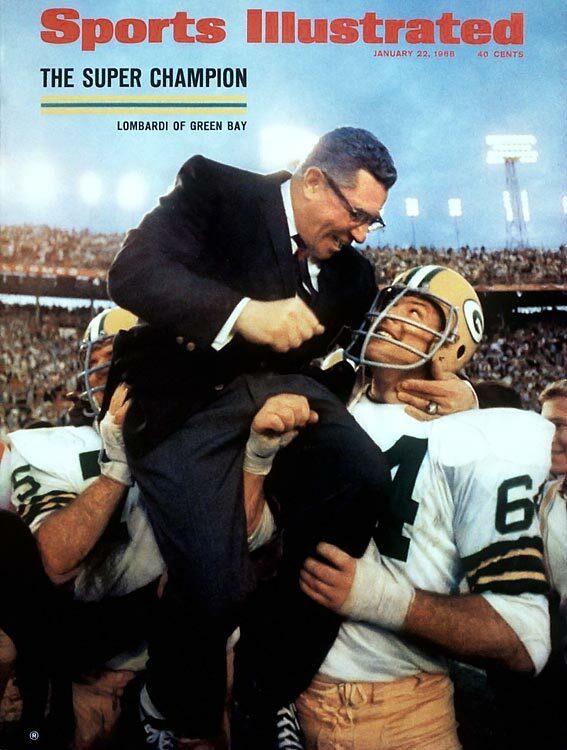 I heard a quote from Lombardi on part 1 of A Football life. To paraphrase it said ” I believe God put a little not finished in all of us”. Can anyone quote that exactly? I’ll look, and I hope others will too.